Crisp, clean lines and panel detailing looks and feels like painted wood. Enjoy low-maintenance beauty with none of the drawbacks of wood or steel such as cracking or splitting, rotting and denting or rusting. View the showcases the Prescott Decorative Glass Collection.Download Script. 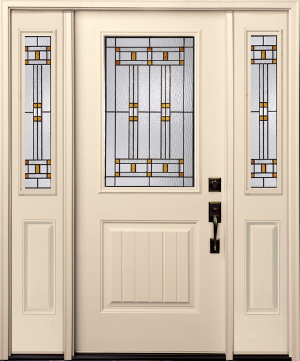 Click here to see the Smooth Fiberglass Doors with Glass. Click here to see the Smooth Fiberglass Solid Panel Doors.